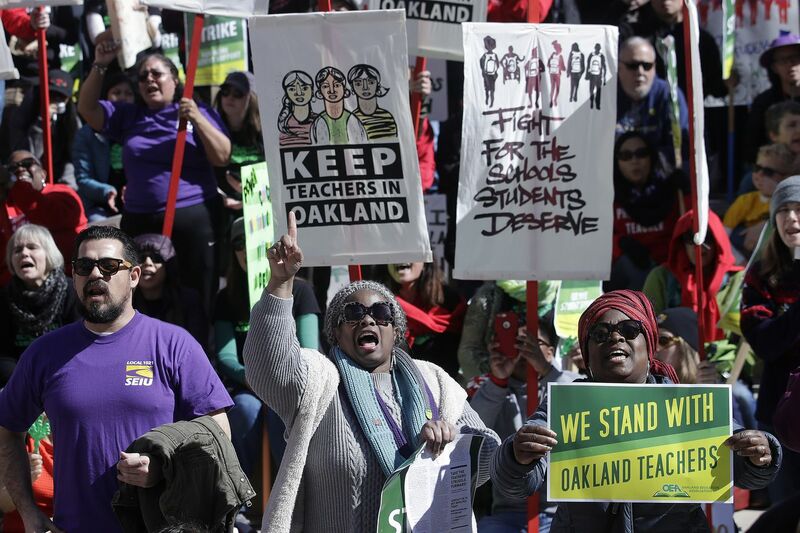 Teachers, students, and supporters rally at Frank Ogawa Plaza in front of City Hall in Oakland, Calif., on Feb. 21, 2019. The nationwide wave of teachers strikes has now lasted a year. Oakland, Calif., teachers went on strike last Thursday, and this week, faculty at the Community College of Philadelphia authorized their union to call a strike vote if their contract isn’t updated within three weeks. Critics of such strikes, including ones printed in this paper, have fallen back on familiar myths to attack these teachers. They claim that teachers and the unions supporting them only care about money and power, that teachers and schools are the reasons students don’t graduate, and that charter schools are the panacea solution. None of that could be further from the truth. I have taught in one of the best private prep schools in the Philadelphia area and have also taught for the last 26 years in one of the best public school districts in Pennsylvania. In my experience, teachers do this job because we want to see a student’s light bulb go on, or we love to impart knowledge, or we want to coach the skills we believe students will need for their future — even when this work comes at our expense while blame is cast in our direction. My colleagues and I had negative real income growth for seven straight years before our most recent contract, while simultaneously having more and more new responsibilities beyond lesson planning, teaching, and evaluating. One year we counted 40 new tasks we needed to accomplish: preparing a new textbook, adapting to new technology, learning new school security procedures to drill, and undergoing state-mandated training for workplace safety, child welfare, and administering state tests, among others tasks. Given that these burdens keep growing as incomes don’t keep pace, it’s no surprise that teachers are leaving the profession faster than at any time on record, per government data. What teachers ask for is to be respected, recognized, and compensated fairly for what we do for other families’ children. The only institutional voice we have advocating for that compensation, and for us in general, is our unions. Yet antiunion campaigns peddle the myth that the pensions unions fight for are taxpayer-funded “freebies” for teachers. Public school pensions are largely paid for by school employees through payroll deductions. For the last 26 years, I have paid between 6.5 and 7.5 percent of my salary into the pension system, with the contracted promise that my school district and the state would contribute an appropriate amount so that pensioners would have income in retirement. I’ve paid significantly into my pension, while being paid far less than many of my friends with similar levels of education, skill, and experience. Pensions are a form of deferred compensation for us mission-driven people who prepare children for their futures. And we’re just as concerned as parents when children graduate poorly prepared for the future. We are not, however, the reason schools don’t succeed. Tomes have been written to show that educational outcomes are as complex as the student composition of any classroom. Social dynamics, technology, psychology, family background, parental involvement, economics and poverty, and school funding all significantly impact educational outcomes. Considering that complex web, it’s woefully oversimplified to suggest, as many union critics do, that charter schools and competition are the saviors for education. Because the factors that affect educational outcomes are so complicated, the idea that simply creating school choice will lead to better outcomes for all students is just wrong. An analysis by the National Conference of State Legislatures of charter school research reports that while some charters improve student performance, many do not or even make it worse, and on the whole, they haven’t become centers of innovation. Research shows, then, that the standard attacks on unions are ill-informed. Charter school loyalists and antiunion activists are undermining communities’ faith in public schools and driving away teachers in droves while drying up the pipeline for quality new educators. They are selling a simple solution based on the myth that the all-powerful market, driven by school choice and charters, will “fix” education. We should be doing the opposite: supporting public schools with better funding and effective pedagogy, shifting our social priorities to value depth in education, and promoting cooperation among local schools, parents, and communities to provide the best possible education for all students. To do any of those things well, we must value and respect the hardworking professionals who care for students every single day. David Klein is 28-year veteran public high school teacher of history and political science in the Philadelphia suburbs.